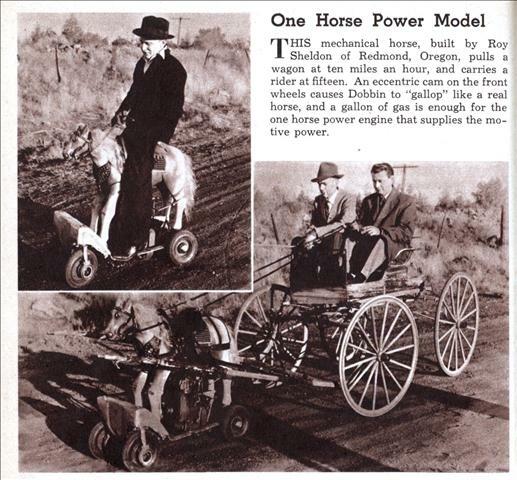 THIS mechanical horse, built by Roy Sheldon of Redmond, Oregon, pulls a wagon at ten miles an hour, and carries a rider at fifteen. An eccentric cam on the front wheels causes Dobbin to “gallop” like a real horse, and a gallon of gas is enough for the one horse power engine that supplies the motive power. This is just to weird, send it to the glue factory. A gallon of gas is enough for what? I can put a gallon of gas in my car, and that will power it, but that’s not going to get you very far. So how far did the mechanical pony go on one gallon of gas? Well in a Critroen 2cv it would get you about 65 miles, a Geo Metro about 50 miles, and a Ford Fiesta about 45 miles. In a Vespa a gallon will get you about 90 miles. So I’m thinking a 1 cylinder, 1 horse power engine might go 100 miles or better on a gallon of gas.